These wonderful ladies came to the Houston International Quilt Festival dressed for fun. 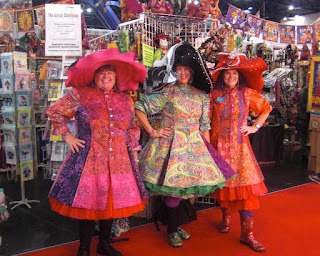 Coordinated from head to toe, their dresses were made from cotton prints designed by Kaffe Fassett. Petticoats of colored netting gave each dress some extra oomph. Years ago, my friend Mary Mashuta coined the term "Flamboyance Quotient." If you are going to create artwear for yourself, you have to know whether your personal flamboyance quotient is high or low. This happy trio can revel in their colorful ensembles, knowing that they are spreading joy, making the day special for everyone they meet. Hooray for all of you out there who happily carry off flamboyant outfits. You bring joie de vivre to everyone you meet. "An Old Woman With Joyous Face"